The best form of advertising for us is by creating happy, loyal customers, time after time. A process that is automatic when you put out a quality product that exceeds our customers’ expectations while being offered at a fair price. You’ll find we’re priced right in line and often times quite less than other aluminum trailers. But you won’t find the quality or attention to detail in those trailers as you will with a trailer from PROLine Products. PROLine Products is family owned and operated. Any time a customer calls a family member answers the phone to make sure questions are addressed in a timely manner. This is a key ingredient to our top-notch customer service. What Type of Trailer Do You Need? 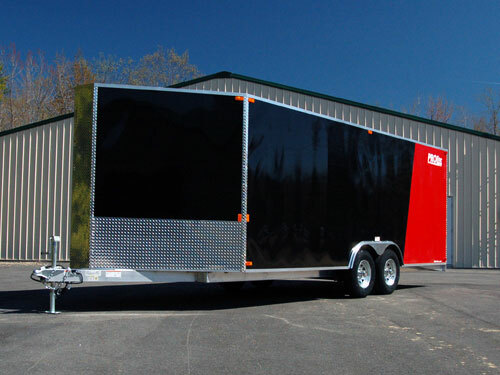 Interested in a completely custom trailer? We’ve invested thousands of dollars in custom aluminum extrusions to help make you the strongest trailer possible. We know what happens to trailers when they leave our facility, they’re immediately dragged over some of the worst roads in the world and they need to work time, and time again. You don’t want to spend your vacation time fixing your trailer and we don’t want you to either. Our frames are designed to be trouble free for years to come. This is why we’ve not only designed our aluminum trailer frames to handle this abuse but we go even further; we fully weld all of our trailer frames. This means we actually flip over the entire trailer deck and weld the other side. Resulting in twice as many welds than most other companies to produce a much stronger frame. This is something you’d never see unless you rip out the floor but it makes for a much more durable trailer. This is one of the many reasons why PROLine aluminum trailers tow straighter and look better, longer. Let’s be honest, not everyone has a garage big enough to house an enclosed trailer, not everyone even has a garage. 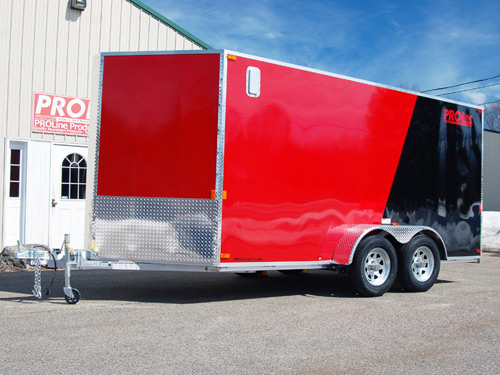 Even further, a lot of people buy trailers to use as a garage for your snowmobiles, motorcycles, and ATVs! So why do other companies build a trailer that can’t handle a snow load? We live in and use our trailers in a snowy climate so I can’t answer that for you but snow doesn’t bother us or our trailers. We build our roofs with rugged 1″ x 2″ aluminum tubes and put them 16″ on center. That means a roof nearly 2.5 times stronger than many other trailers on the market. This doesn’t mean that you can leave your trailer in Northern Maine and let 10′ of snow pile up, but when you see a Nor’easter in the forecast you’ll feel confident your trailer will be recognizable the next time you see it! PROLine’s trailer structures are fully integrated components, each and every sidewall upright is welded directly to the trailer deck and to the roof creating a single structure. Prior to welding, every trailer gets checked to make sure it’s square, clamped in with additional bracing to lock in those dimensions, and then welded. This minimizes weld distortion to make sure your trailer will be put together square, keeping your trailer nice and tight and the weather out. Odds are you’re likely buying a trailer to haul around some prized possessions. Whether it’s your new (or old) Mustang, a few snowmobiles, or your precious motorcycle. When you tie these items down to the trailer you need confidence that they’re going to stay there for the duration of your trip. We can’t tie down all your cargo for you but you can be sure that whenever there is a tie down installed on your trailer it was done properly. All of our D-rings have a proprietary aluminum backing plate that gets welded to the trailer frame so when you’re tying down that new Porsche you don’t have to worry about pulling up the trailer floor. Same thing when tying down to our Quick-Adjust Floor Rails. Our Quick-Adjust Floor Rails are welded to every floor cross member, effectively tying down to the frame, not the floor. And the optional E-track on the walls of our trailers? We weld in additional aluminum tubing to the wall uprights to ensure that your E-track is properly locked into the traielr walls. Every trailer is checked and double checked so it leaves our shop looking its best. 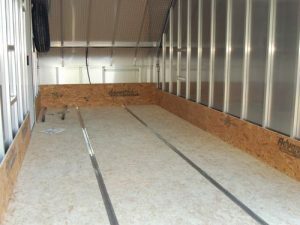 We make sure that every trailer we produce leaves looking clean, with screws lining up, lines cut straight, doors installed tight, and every trim screw properly located. Some might wonder if it’s worth giving a trailer this much extra attention, but every time a customer sees one of our trailers the look on their face assures us we’re doing it right. It’s the little things we do that let you know we care about our products and our customers. Whether it’s the rain gutter over the side door or all the interior lights that come standard; we want to build you the absolute best trailer possible. What good is a strong frame if you don’t have the components to support it? This is why we use the best parts we can find to go into our trailers. We only use galvanized Dexter Torflex Axles™ on our trailers and these axles all carry a 10 year warranty on their suspension systems. Torsion axles provide a smoother, quieter ride, and last much longer than spring axles. These axles also come equipped with E-Z Lube Hubs. When installed our axles aren’t bolted through the frame that would result in a stress point in the frame; we weld on axle plates and bolt through the sides. We don’t carry a painted steel rim. Why buy a nice aluminum trailer just to have the wheels rusting almost immediately? Our standard wheel is galvanized to make sure it stays looking great for a long time. And of course we offer an upgraded aluminum wheel option. LED Lights are standard on every one of our trailers. Also we never use a single diode LED as a clearance light! Our clearance lights all have multiple diodes in them for a better quality and brighter light. Additionally, EVERY enclosed PROLine trailer comes standard with multiple LED interior lights that are switched by the side door and in most cases there are 3 or 4 lights. We like to see what we’re doing, we figured you probably do too. Our ramp door hinges are aluminum and equipped with grease fittings to keep them operating smoother longer. No more stainless steel strap hinges that get brittle over time and break. We use quality radial tires on ALL of our trailers. And all of our tires come with a 5 year warranty plus 2 years of roadside assistance! If one of our trailers has brakes on it we don’t skimp and use the cheap 8″ brakes. We use the full size 10″ electric brakes and the brakes go on both axles on the tandem axle trailers. No nonsense charges and hidden fees either. We’re even using Dexter’s self-adjusting brakes as a standard feature! Saving you time and money but more importantly, making sure your trailer will stop when you need it to! We’ve heard it too many times that trailer lights only work for the first year and then the corrosion kicks in. Before you know it you’re re-wiring that “brand new” trailer. This is why we run all of our electrical for the lights inside the trailer and not along the frame. The only wires run along the frame are for the trailer brakes which are coated in a waterproof insulation. Stainless steel carriage bolts fasten our hinges and door bar locks to the trailer frame for security and long term good looks. We use hardened bolts to mount our axles to the frame and for our trailer couplers. We fasten our electric brake wire to the frame with vinyl coated metal clamps screwed to the trailer frame, not the stick-on variety others might use. Why are your aluminum trailers more or less expensive? Yes, we hear this question on both ends of the spectrum. 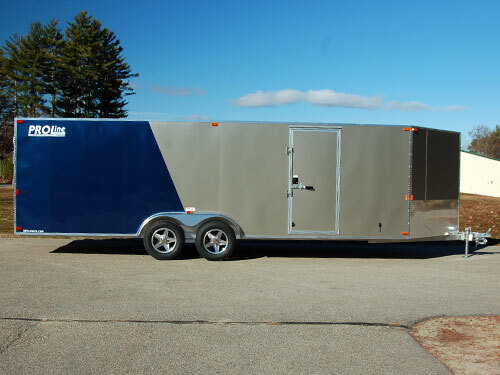 If you find our trailers expensive, odds are you’re either comparing it to a steel framed trailer (which would be MUCH less expensive than ours) or another aluminum trailer without the same great features that we put standard on all of our trailers. Price out that same enclosed aluminum trailer with the features we give you standard on most of ours (Dexter Torflex Axles w/ EZ Lube Hubs, galvanized wheels, radial tires, LED lights, 3/4″ flooring, quality side doors, ramp doors with spring assists, roof and walls on 16″ center, all aluminum & fully welded tubular frames, etc). You’ll find we’re typically priced right in line and often times quite less, and you want find the quality in whatever other brand trailer as you will in a PROLine Products LLC trailer. Why don't you have any dealers? In our time of making trailers, we’ve found that “trailer dealers” typically only try to sell what they have sitting on their lot. 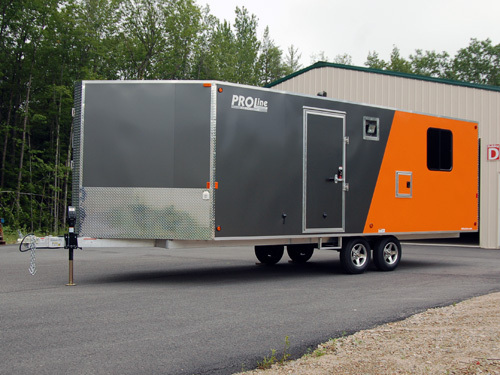 Here at PROLine, we pride ourselves on selling the right trailer to the right customer so it’s best our customers contact us directly to help them get into the perfect trailer for their needs. Being the manufacturer we’re just as happy to custom build a trailer for someone as to sell them one off our lot. It’s all about identifying and meeting our customer’s needs then exceeding their expectations. Do you perform trailer repairs? If a trailer that was originally made by PROLine Products LLC is damaged we are happy to help and get it back on the road, however, we DO NOT do any repairs on any other brand’s trailers. How long does it take to build a trailer? Lead times typically keep us out anywhere between 3 and 6 weeks but can be longer. If you need a trailer in a hurry please check out our inventory page to see what’s currently available. Also, don’t be afraid to call because we’re always building trailers to have in inventory and may be building exactly what you need. For deposits we can take Visa, Mastercard, Discover, cash, or check. For final payment of your trailer we request that you pay in cash or a bank check. We also have financing available through Sheffield Financial. Can I come look at your trailer inventory? The overwhelming majority of our completed trailers are stored in a warehouse until they’re purchased and picked up. If you come during business hours we can show you our current inventory as well as any completed and ready to pick up trailers. So come on by and check out why PROLine aluminum trailers are the best quality and best value.